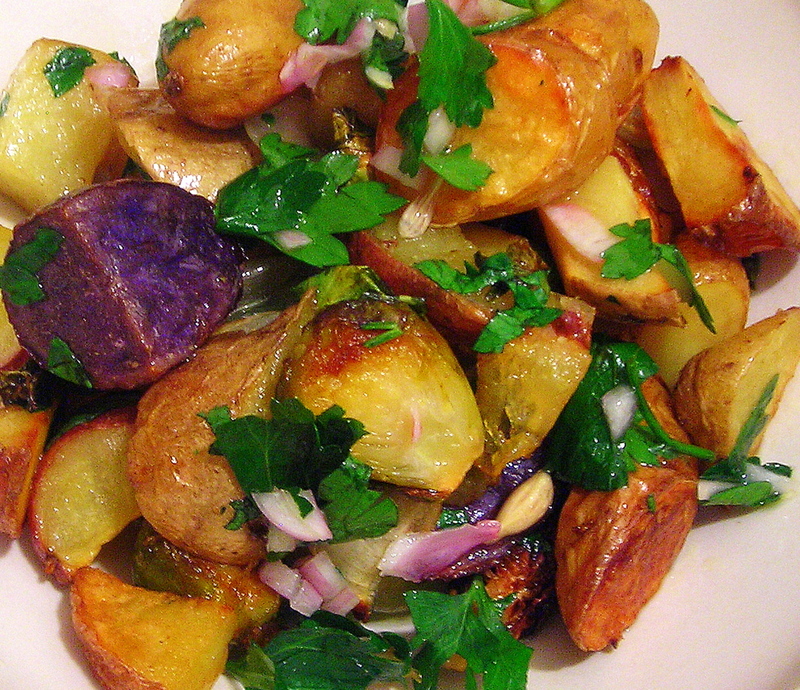 Bintje potatoes, Purple Peruvians and La Ratte fingerlings, brussel sprouts, gold cippolini onions and baby turnips were tossed in extra-virgin olive oil and a generous pinch of kosher salt, then roasted at 375 F for 40 minutes. Wonderful as is, even better with a lemon-shallot viniagrette (juice of half a lemon, 3 T. olive oil, salt, one shallot, parsley). Sometimes the best dishes are the simplest. Click here for a large-size version of this picture. 21 Mar	This entry was published on March 21, 2010 at 4:48 am. It’s filed under food, general, vegetarian, winter and tagged brussel sprouts, potatoes, recipe, snack, vegetarian. Bookmark the permalink. Follow any comments here with the RSS feed for this post. I agree, simple dishes – done well, with good ingredients – are my favorites. Yeah! Yummy food! Pretty pictures!